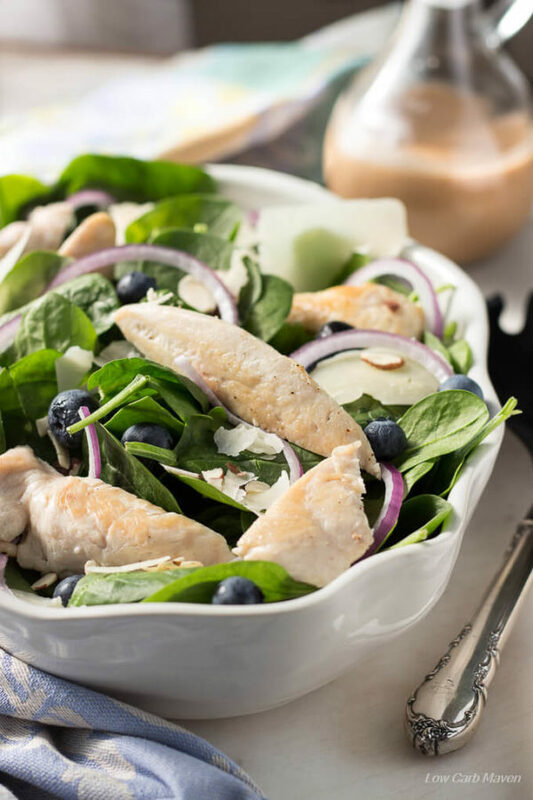 This great Chicken Spinach Blueberry Salad with Parmesan cheese and balsamic dressing is a fast and easy low carb meal perfect for any ketogenic diet. 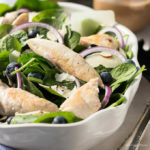 My husband and I enjoyed this chicken spinach blueberry salad for lunch the other day. He told me it was just as good as any restaurant salad. I think he was just happy that he didn’t have to make it. You know how meals always taste better when someone else makes them. But, it is a good salad full of simple ingredients that taste great together. I eat a salad for lunch almost every day. Salads are refreshing, easy to make and offer endless combinations of tasty ingredients. They are the perfect lunch for someone on a low carb diet because they take a long time to eat. With all of the forking and chewing that goes on with eating a salad, your brain has ample time to register that the stomach is full. I have a few nice salad recipes on the site like an Herbed Grilled Chicken Salad and a beautiful Cobb Salad. And I have many delicious low carb salad dressing on the site, too. Try the Garlic Herb Vinaigrette, Basil Mint Vinaigrette, Blue Cheese Vinaigrette, Orange Shallot Vinaigrette or my favorite Lemony Caesar Dressing. 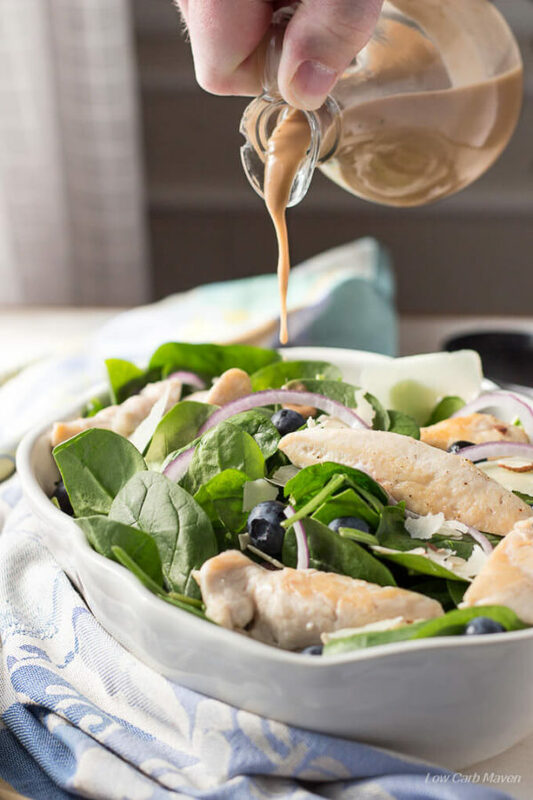 I’ve included a nice recipe for balsamic dressing with this chicken spinach blueberry salad. A stick blender makes it come together fast, but a mini food processor works well too, as does shaking the ingredients together in a small glass jar. The ingredient combination in this salad is surprisingly good. The chicken can be grilled or sautéed in a pan, but rotisserie is a fast option. Spinach is a great low carb salad green and has a great texture. I added just enough red onion to provide a slight sweet onion flavor while the blueberries add an occasional burst of spicy fruity flavor. Toasted almonds offer crunch and Parmesan cheese adds a salty-sweet-nutty component which balances nicely with the acidic dressing. Grill or saute chicken until cooked through or use 6 ounces of rotisserie. Cut chicken into bit sized pieces. While the chicken is cooking, toast the almonds, slice and mince the onion, and make the balsamic dressing. Toast the sliced almond in a dry frying pan over medium heat until fragrant and barely beginning to brown. Remove to cool. Add the ingredients for the balsamic salad dressing to a small bowl and blend with a stick blender. Alternately add the ingredients to a mini food processor or place them into a glass jar and shake by hand. Arrange the spinach on two large dinner plates. Evenly divide the spinach between the two plates. Top with the remaining ingredients and the dressing. Makes 2 large salads. Very lovely salad – the taste of the shaved Parmesan with the balsamic dressing is wonderful! This salad looks better than any restaurant salad I have ever seen! I am trying to eat carb free at least in the evening, it is a challange as I love bread more than it is good for me, but your blog already gave me such good ideas. And when I see that you are low carb all the time, motivates me.